I've been doing webcomics since I was 15, and for the most part, in the beginning, critical acclaim and readership were fun surprises. An added bonus. I was a girl from Portugal who'd never been to any art school surrounded by north american peers with more opportunities than I could shake a stick at and I had no right to believe anyone would care about anything I ever made. At some point, though, people did. A little bit. Fleetingly. I started Peritale and people seemed to really like it for a while there until interest dropped pretty much instantaneously. I figured I just had to work on something new, and Roji seemed simple enough to do. I'm not saying I felt nothing about the story, in fact, I was really excited about where it was going to go, and I had a real appreciation for how fun and charming the characters were to draw. But, essentially, Roji was supposed to be somewhat of a comeback comic, and it wasn't. I'm really, really not proud of the person I was at the time. Roji was essentially a product of disillusionment more than anything. But, I was doing comics since I was 15 and I'd started a new one, and I wasn't about to quit. I'd never quit a comic in my life (none that you can prove hahaha). 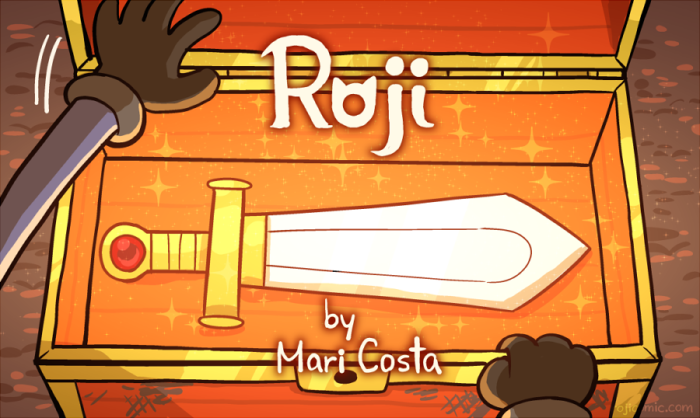 Even if Roji wasn't doing so hot, I had fun drawing it and coming up with fun adventures. I had to look at the pages again while choosing things to put in my portfolio and even after all this time I think Roji is some of the best, most enjoyable cartooning I've ever done. I'm so proud of the work I put into it, even if it didn't last long. I had no intention of quitting. Anyway, depression is a hell of a drug. Around the time Roji started falling off the map was one of (but not the) worst depressive crises I'd ever experience. I could barely motivate myself to pick up a pen. My brain was giving me the option to choose between one of my ongoing projects. Just one. And I'm gonna be honest with you guys, the only reason Roji was the comic that got the chop was because it had less pre-prepared thumbnails I could go off of. I couldn't stand to look at anything I produced at the time. I honestly though I was going to drop off the face of the internet forever. And then I got better. Somehow. I barely remember the actual episode, let alone the recovery, but I did get better. I still resented Roji, for not being what I wanted it to be, so I didn't pick it back up. And then I stopped resenting it and I got so, so embarrassed that I dropped a comic without any warning like that. Every email from the hosting platform asking me to renew the website and every ask (and there were a lot of asks over the years) were a reminder of how badly I'd messed this one up. I am so sorry for ignoring these messages, I am so sorry for not saying anything. I am so sorry this is so late.